Another well marked low has appeared in the Arabian Sea, west of the Gujarat coast. The system has since moved west, and latest as on 10th. night lay just off the Oman coast, with deep clouding very near Oman. Suspect system is likely to persist off the Oman coast for a day, before fading out. Some rain is likely on the south Oman coast, and light rain in Muscat area on Wednessday. But this system, like the prevoius one last week, has again pulled away the monsoon current , though temporarily, from the west coast of India. The sudden spurt of rain, and quick before time monsoon advance along the west coast upto south Gujarat coast will be halted for a few days. Hence, there is possibility of some let up in the rains, for next 4/5 days, in the Konkan region and coastal Gujarat. Due to the slowly building up low pressure in the mid Bay region, moderate ains may still continue in the coastal areas of Karnataka. But the bay low seems to be taking its time to form. It seems from forecast models, that the proper formation of any system in the bay may still take another 4/5 days from today. Also, a trough running across central India through M.P., has brought rain across the region in the last 2 days. 1. A weakening of rainfall in the monsoon areas of Konkan (Mumbai can breathe a bit) for the next 5 days. Weak rains in the deficient Kerala region and interior Karnataka in the same period. 2. Halt in the further progress in monsoon towards Gujarat, again for atleast next 5 days. 3. Still no monsoon rains in the "yet to arrive" regions of interior Maharashtra. 4. Due to unseasonal rains (W.D. 's) in the northern belt of India/Pakistan in the last fe w days, actual monsoon advance may be halted towards north as low and below normal temperatures prevail over the entire northern sub-continent. Some isolated thunder showers expected in Sindh coast region around Karachi on Wednessday, due to the Arabian Sea system. 5. Eastern areas of bengal, north-east and Orissa remain bereft of real meaningfull rains. A proper "systematic monsoon rain" over Kolkata and the bengal areas has yet to occur, though time wise it is not late as the monsoon normally sets in around 10th. June. For the next major revival and northwards push of the monsoon, the bay region has to be obseved, as the low developing there seems to be taking its own time. No international forecast model shows any system there till 16th. June. 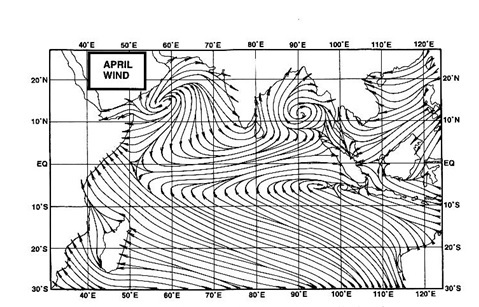 The silver lining is that IMD has forecast a low off the east coast, near Orissa, in the next few days.